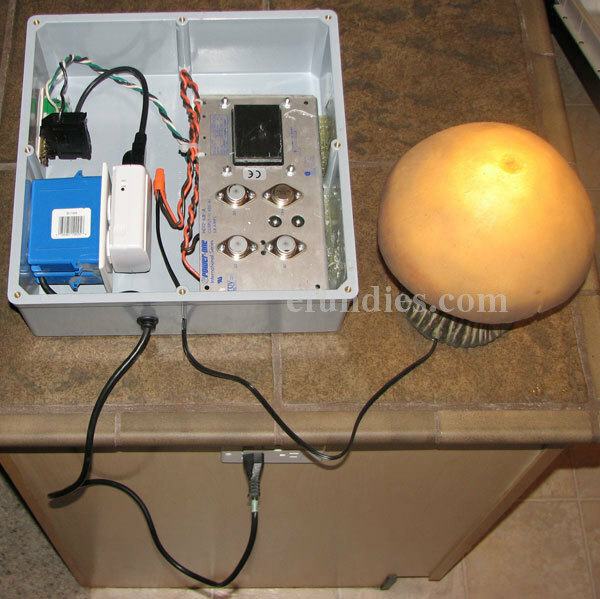 Low voltage lighting controllers are usually based on a nice little transformer with a mechanical timer on it. You set the timer to turn your outdoor lighting on at dusk and off at dawn. The problem with this solution is that you have to continually adjust your timers as the seasons change. The other problem is that there is no way to turn the outdoor lighting on if you want it on early, or to turn it off if you happen to be a stargazer. One solution is to control your outdoor low voltage lighting with Insteon. This can be done a variety of ways, but we chose to make the whole thing watertight and locate it outside. You could run your low voltage wires into your garage or house and locate all of the controls there, as well. Here is what ours looked like when assembled. A description of what is happening follows.